Life is full of contrasts. I have discovered that when there is way too much sadness in my life a few hours in the sun with a paint brush in my hand can be absolute bliss. Debbie and I both lost family members yesterday. 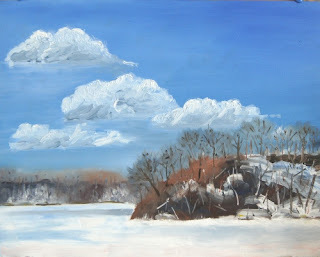 She headed out of town early this morning to be with her family and I headed to Coote's Paradise with my paints. I am excited about this. It isn't perfect but no painting ever is. It was a fantastic day to paint. There were just enough clouds to make the sky interesting but not enough to block out the very warm sun. It was about -2 C but with the sun and very little wind it was quite comfortable. We were on Paddy Green Road just outside Dundas. I am pleased with this. I think that I caught the lazy early spring feeling. Lots of snow but with an obvious warmth.